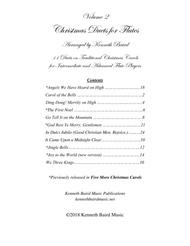 Many have loved the duet arrangements found in the original collection of 12 Christmas Duets for Flutes arranged by Kenneth Baird. Volume 2 is now available! As in the original collection, this is a delightful collection of intermediate to advanced-intermediate level duets based on traditional Christmas carols. They are challenging at times (not for beginners) without being overwhelming; at times joyful, at times uplifting, at times serene. There's even a very jazzy version of Go Tell It on the Mountain! In addition to being a joy for friends to play together, they are a great resource for teachers to play at lessons with their students, they are are suitable for informal Christmas performances, and many are appropriate for church services. Note: the duets in this collection have NOT been arranged to be fully compatible with Mr. Baird's duet collections for other instruments. Instead, these have been arranged specifically for flutes. 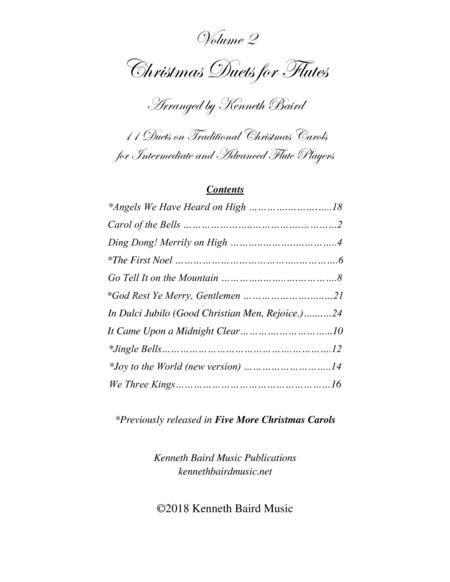 This collection does include the duets found in previously released Five More Christmas Duets for Flutes by Mr. Baird. Included in Christmas Duets, Volume 2, are: Carol of the Bells, Ding Dong! Merrily on High, the First Noel, Go Tell It on the Mountain, It Came Upon a Midnight Clear, Jingle Bells, Joy to the World (a more traditional version than found in the original duet collection), We Three Kings, Angels We Have Heard on High, God Rest Ye Merry Gentlemen, and In Dulci Jubilo (Good Christian Men Rejoice). If you are looking for simple harmonizations of Christmas Carols, this collection is not for you. If you are looking for something more, you've come to the right place.